I've been on a massive cleaning and uncluttering spree since the holidays in preparation for Chinese New Year. One area that got a huge downsize was my beauty products as I got rid of a bunch of products that have probably lived well past their shelf life or that I simply don't want to use any more. I've been in a mindset of quality over quantity for awhile now and I really want to be more intentional with the purchases I make in every area of my life. At the same time, I've been testing a few products from Bright Planet which would fall in line with this philosophy. I first learned about the brand when I received a really nice email from Diana, the owner and CEO of Bright Planet. My interest was totally piqued when she said that her business was about helping people live healthier, happier lives. The Bright Beauty line is made up of 100% natural, vegan and cruelty-free products that are packed in the most eco-friendly packaging possible. Not only does she want to create products that people can feel good about using but she also also wants to create a community for people who care about living healthy and enriching lives. In addition to being a one woman show running Bright Planet, Diana is a mom, works full-time as the president of an ad agency and she's even written a Sherlock Holmes novel. This lady does it all! 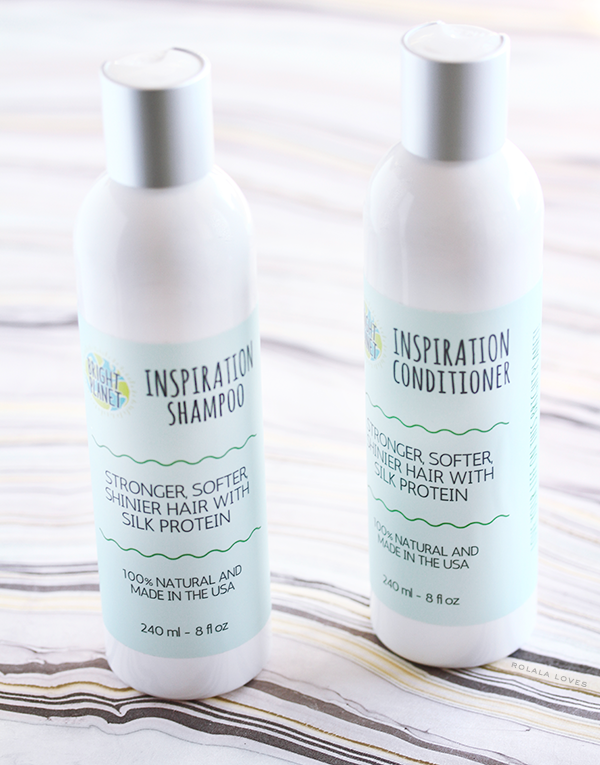 Bright Planet's Inspiration shampoo and conditioner are made from pure and natural ingredients and feature a protein enhanced formula with silk protein, horsetail extract, raspberry extract, chamomile extract, panthenol (vitamin B5) nettles extract and hyaluronic acid. It is suitable for all hair types and safe for color treated hair. I tend to be particular when it comes to my shampoos and conditioners and I really liked both of these. Using the shampoo was an invigorating experience thanks to it's grapefruit and mint scent. And I was surprised by how well it lathered up for a natural product that doesn't contain any sulfates. Best of all it left my hair feeling clean and soft. And the conditioner was lovely as well and my hair silky smooth afterwards. And when it came time to style it, my hair was both manageable and full of volume and shine. My husband has also been using these and he was impressed with how well they clean and condition. This pure and gentle cleanser cleans and treats skin with echinacea extract, an anti-inflammatory that heals acne, eczema and psoriasis while protecting it from sun damage, gotu kola extract, which has been shown to stimulate collagen production, calendula extract that has anti-irritant and anti-inflammatory properties and rosehips extract which helps with collagen regeneration. This is a creamy cleanser that I found works best for me in the morning. It feels mild and nourishing which is what my skin needs to start the day. I sometimes do exfoliation treatments in the AM and when I don't this has been my go to cleanser. It has a subtle scent that is lightly citrus and herbal at the same time. It always leaves my face feeling nice and soft. I think this is a totally serviceable cleanser but it's not that effective at removing makeup which is why I don't use it at night. Bright Planet Sour Cherry Scrub uses finely ground walnuts to exfoliate. It also contains sour cherry juice that has wonderful antioxidant properties, anti-aging vitamin c (l-ascorbic acid) and mangosteen extract that is anti-viral,anti-bacterial, anti-fungal. This product is safe for all skin types and doesn't contain any artificial dyes or fragrances. I've been using this scrub mainly as a dry patch exfoliator on elbows, knees and heels. It feels gentle and effective. I don't really know how to describe the scent other than it's quite faint and smells a little sour. I'm not crazy about it but it also doesn't bother me since I know this is a natural product that is totally safe to use. I'm really glad I got to try out the Bright Planet line and I would totally recommend them. My favorites would be the shampoo and conditioner. These are definitely products that you can feel good about using and the company's values are also admirable. 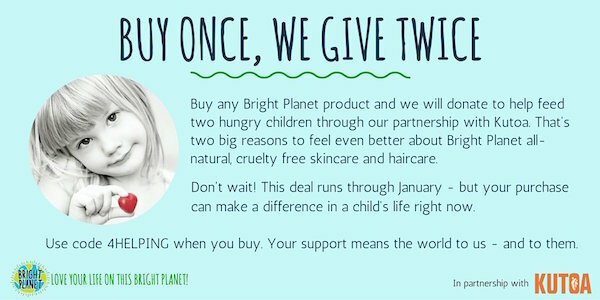 Bright Planet not only wants to make a difference in the beauty world but it also wants to make a difference in the world itself. In their latest initiative, they’ve partnered with KUTOA, a likeminded company dedicated to feeding children in need. With every single purchase made through the end of January using the campaign code 4HELPING, they will make donations to help feed two hungry children. The Bright Planet beauty line is available for sale on Amazon. And yes they are Prime eligible so you can get free one day shipping. To learn more about the brand, be sure to visit their website. Find out what's new and get great tips on the Bright Planet Blog and connect on Twitter or Facebook. Diana also mentioned to me that she is working to add a body butter, conditioner bar and tinted lip smoothie to the line soon so there are some exciting things to look forward to! I'm pretty excited about the body butter myself. 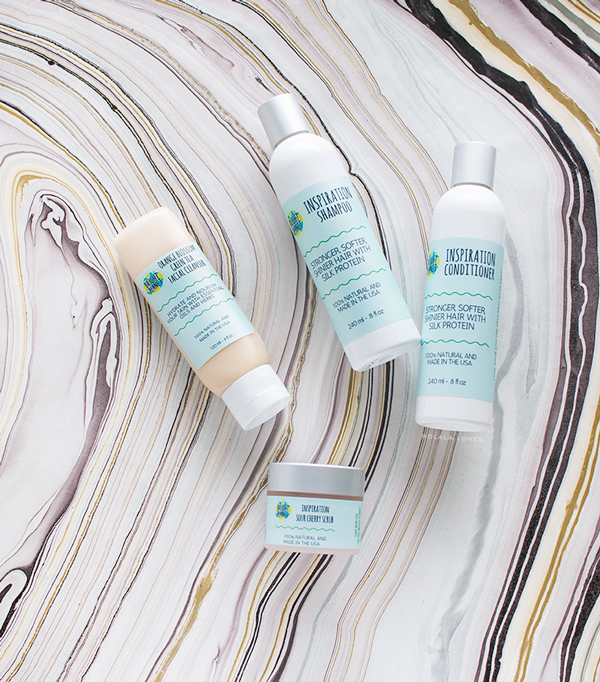 What do you think of this natural beauty line? Which product would you be interested in trying? Disclosure: These products were press samples provided for review. There was no other compensation and all opinions and words are my own. The cherry scrub is really interesting! You definitely have me intrigued, Rowena! I love the philosophy behind the brand, and I totally subscribe to the "quality over quantity" philosophy. 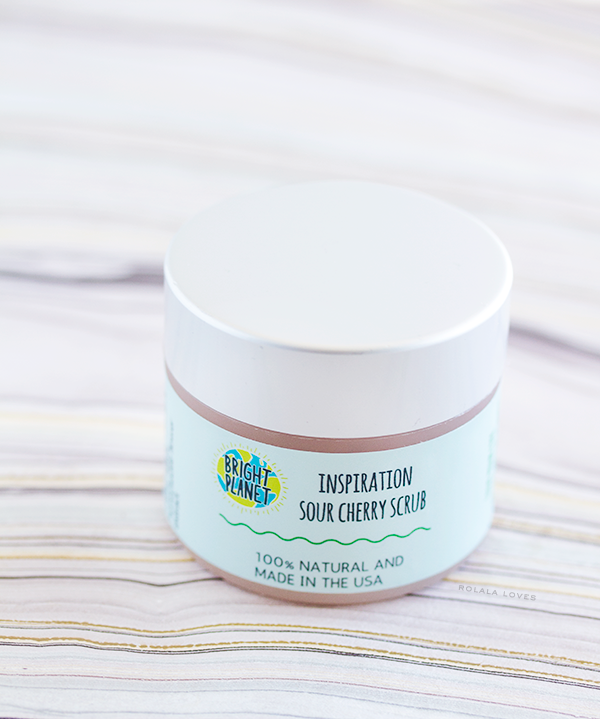 I would love to give this brand a try, especially when it comes to that lovely sour cherry scrub - that sounds amazing! I like that the company give back and the packaging of the items is perfect. I agree with the comments above:) I love companies who give back and try to really make a difference, you know? Since I like anything with calendula, that facial cleanser would probably be the first one I'd try:) TY for this review, Rowena. I love brands with such a strong philosophy, it makes me even more eager to try them. I am all for quality over quantity. Sounds like an amazing brand and I am sold. I have been on a massive decluttering mission for CNY too! Haha! My husband swears that I am getting rid of stuff so I can buy new ones but I just want a smaller and practical collection. You wrote an amazing review and introduction post to this brand, Rowena. I wonder if they are available on Amazon.ca? I've noticed Amazon.com and .ca offers different stuff. I always love reading about natural cosmetics brands. It is great that this one uses only natural ingrediants and it is a great plus it is vegan/cruelty free. The lady who runs this bussiness sure sounds like an inspiring women. That shampoo seems wonderful. I would love to try that...and that facial cleanser sounds promising. This line looks very interesting! Thank you for the introduction and I think the green tea cleanser sounds like something I would enjoy. I will have to check out their website. So love hearing about new products !! This sounds like such a wonderful brand! I love to try the shampoo...the grapefruit and mint scent sounds perfect! Oh this sounds like an excellent line and I like that they give back. I could see this in the Whole Foods in Chelsea. And she wrote a Sherlock Holmes novel wow. 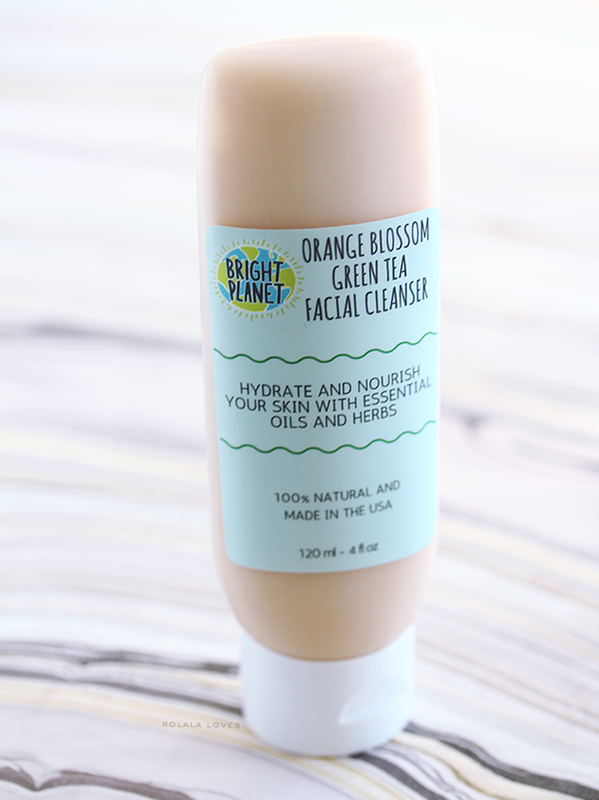 Their use of all natural ingredients stood out for me, and I think that is totally awesome. Great products; I would try the cleanser and scrub. So nice that you got to try this brand. And like you, my aim is also to regularly declutter and keep quality over quantity. I haven't even heard of this brand before, I would love to test it out for sure :) Great review! I love the philosophy. I am not familiar with this brand, but it sounds promising. Would love to try the shampoo, well actually would love to try everything. Sounds too good. Happy weekend, doll. Love to try the green tea facial cleanser. Rowena, I love their philosophy! So happy you got to sample their products. They sound really good. I just threw out some products myself. It's important to do so. The products sound really nice smelling and it's great to hear they worked well! I've been clearing things out as well and it's always so satisfying! !